Note: This article was originally published in the June 2008 issue of the Denver publication Community News. It turned out to be both extremely interesting and rather fun to do the research for this article, which was inspired by something that many others of you may have received via email recently: a rather astonishing list of the supposed benefits of bananas. Those benefits go far beyond the well-known and well-documented ability of the popular fruit to boost energy (due to its natural sugar content) and to lower blood pressure (due to its high potassium content). In the list I received from a friend, it claimed that bananas can be used to treat a wide variety of other ailments, such as anemia, constipation, depression, hangovers, heartburn, morning sickness, mosquito bites, SAD (Seasonal Affective Disorder), PMS, ulcers, and even warts. As I wrote back to my friend, this is amazing if true. But there's the rub. How does one go about finding out whether these claims are based on any solid evidence? That was what took some digging on my part. There turned out to be dozens of articles on the Web about bananas, with most of them apparently quoting each other, which was not a lot of help. Eventually I selected and then carefully read some 25 pages of information that seemed fairly sound to me, based on the sources and the scientific studies cited. From those pages, I have put together what you are reading here, which I hope you will find both interesting and useful. Amusingly enough, one of the first articles I read, one from a site called TruthOrFiction.com, pretty much refuted the popular, widespread e-mail (the "eRumor") mentioned above. That is, a spokesperson for Chiquita Bananas was happy to concur that bananas are indeed nutritious, high in vitamins, minerals, and fiber, but he said that much of what is in that email is based on assumption, that many of the statements are "without any substantiation." So I guess if you have morning sickness, mosquito bites, SAD, PMS, or warts, all you can do is try bananas and see what happens! Please let me and the editors of TruthOrFiction.com know what you find out. Reading further, I was able to discover numerous pages of presumably reliable information about bananas, their history, and their benefits. No "eRumor" hype is needed to make this collection of data interesting enough for just about anyone, in my opinion. So please read on, and see if you agree. Bananas do not come from trees, but from large plants that are giant herbs related to the lily and orchid family. The bunches of 50 to 150 bananas in which they grow are known as "hands." Bananas originated in Maylasia about 4,000 years ago. They had a long route to traverse from there to the U.S., where they were not sold until the latter part of the 1800s. From Maylasia, they spread throughout the Philippines and India. Arabian traders introduced them to Africa. Portuguese explorers discovered them there in 1482 and took them to the Americas. Today, the main commercial producers are India, Costa Rica, Mexico, Ecuador and Brazil. Bananas grow in most tropical and subtropical regions. There are more than 300 varieties of bananas. They are the fourth most important staple food in the developing world. The annual global production is some 86 million tons. They are the most popular fruit in the U.S., and the average American eats 25 lbs. of bananas per year. Whether or not you like the taste and texture of bananas (some people dislike the latter), there is no denying that they are nutritious, as well as handy to eat, coming as they do in their own natural, biodegradable "wrapper." They are high in Vitamin B6, Vitamin C, potassium, dietary fiber, and magnesium, but free of sodium and cholesterol. They are almost fat free, and relatively low in calories. Depending on its size, a banana has only about 90 to110 calories. They contain high-grade protein and three of the essential amino acids. Bananas and milk supplement each other very well. Bananas make excellent snacks for both adults and children. They are a great source of instant energy, either before your workout or after it. Due to their potassium, they help muscles contract properly during exercise and reduce cramps. Because of their sweet taste, they can substitute for sweets and help satisfy sugar cravings. Yet they are fairly low on the glycemic index, between 30 and 60, based on their stage of ripeness. The less ripe they are, the lower they are on the glycemic index, and vice versa. 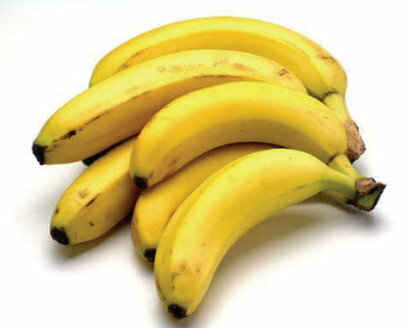 A less ripe banana - yellow but with no brown speckles - provides longer lasting energy than do most sweet foods. But after strenuous exercise, when muscle energy is depleted, a ripe banana - one with numerous brown speckles on the skin - can deliver very quick energy. Extremely ripe, mainly brown bananas are not "bad," so don't throw them out. They are very good for baking into muffins, banana bread, and the like. The overall nutritional content of the banana is not significantly altered by its stage of ripeness. When you buy bananas, make sure that both the stems and the tips are intact. Ripe bananas can also help boost mood and help promote sleep, due to the serotonin and tryptophan that they contain. However, it is probably too strong a statement to say that they can relieve true depression. Very few people are allergic to bananas, and they are often the first solid food given to babies, who tend to love them. They make a healthful way to help supply the energy needs of growing, active children. Less ripe bananas help relieve constipation. Riper bananas help relieve diarrhea. Bananas are easy to digest. They are a very good source of fructooligosaccharide, a compound called a prebiotic because it nourishes the friendly probiotic bacteria in the colon. These friendly bacteria help improve our ability to absorb nutrients such as calcium. In most people, bananas have an antacid effect, and can help protect against stomach ulcers and ulcer damage. They do this in two ways. They help activate the cells that compose the stomach lining, and the protease inhibitors in bananas help eliminate bacteria that have been pinpointed as a primary cause of stomach ulcers. People who are allergic to latex may also be allergic to avocados, bananas, and chestnuts. Fruit processed with ethylene gas might be especially troublesome. Therefore, if you know you are allergic to latex but want to try bananas, buy organic ones not treated with gas. Fruit may be even better than carrots for your eyes. Three or more servings of fruit per day may lower your risk of age-related macular degeneration (ARMD), which is the primary cause of vision loss in older adults. So a banana smoothie in the morning, or a small banana sliced over your whole-grain cereal, may be just what the opthamologist ordered. High fiber foods, such as bananas, can help prevent heart disease. The potassium in bananas, in addition to its benefits to muscles, can help promote bone health. That's because it helps to counteract the loss of calcium (secreted in the urine) that is promoted by the high-salt diet so typical of most Americans. It's not true that you should never refrigerate bananas. If you have some ripe bananas that you want to keep from ripening further, go ahead and refrigerate them. That shuts down the ripening process, which can�t be restarted once the fruit is warmed up again to room temperature. Refrigerating a banana will cause its skin to darken, but the fruit inside is unharmed, remaining firm and delicious. If you want to freeze bananas for later use, puree them first, or peel them and put them in plastic wrap. Some people enjoy frozen bananas in hot weather. I plan to try that this summer. If you want to speed up the ripening process in bananas, put them in a brown paper bag overnight with an apple or a tomato. That concludes the list of the main benefits of bananas that I found. I hope you enjoyed this article, and that it will inspire you to enjoy bananas more often and in more ways. Now feel free to go to the store and "go bananas"!